Sometimes, you'll see the words heterogeneous and homogeneous used in IBM terminology. These bigs words actually have quite a simple means. homogeneous simply means that two or more products are at the same version. For example, if you have two WebSphere application servers, and both are version 9.0.0.1, they are homogeneous. heterogeneous means that two or more products are at different versions. 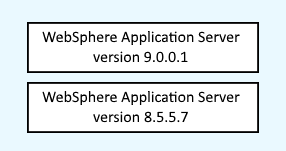 For example, if you have two WebSphere application servers, where one is version 9.0.0.1 and the other is 8.5.5.7, they are heterogeneous.